According to a recent report on ABS-CBN.com, 8-division world champion Manny Pacquiao held a press conference shortly after returning home to General Santos City, Philippines, informing those in attendance that negotiations for a fight with undefeated pound-for-pound champion Floyd Mayweather are currently taking place. "Negotiations are ongoing for my fight with Mayweather, but nothing is final," he would comment. Evidently, the fighting congressman from the Philippines has been misinformed. Contrary to his belief, negotiations have yet to even begin and are far from ongoing, especially considering that both his advisor, Michael Koncz, and his promoter, Bob Arum, have made it crystal clear that they have no plans whatsoever to negotiate or even discuss Pacquiao's next opponent until after the holidays. "As to whom our next opponent is or whether Marquez IV, we are going to take a few days and relax. Let Manny enjoy his family and then we will sit down and talk. There is no rush. We usually don't make a decision as to our next fight, when we fight in November, until after the Christmas holiday," Koncz would tell Keith Terceira of MP8.ph, Manny Pacquiao's official website, just last week. He would echo those exact same comments to Lem Satterfield of RingTV.com. "There's no need to rush into anything. We're not going to rush judgement about who we're going to fight or when we're going to fight. After the holiday season, we'll get with Bob Arum and discuss options. 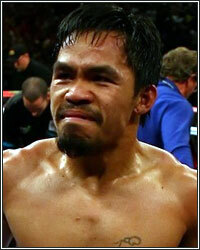 The facts of the matter are that Manny Pacquiao just went through a very difficult fight. As always, we'll take a couple of weeks just to relax. Manny will enjoy his family," Koncz explained. "We haven't even discussed anything with our promoter, Bob Arum, nor will we intend to discuss with our promoter, Bob Arum, anything about any fights probably until after the Christmas holiday. If anybody is inclined to come to us with a reasonable offer to fight, they can reach out to myself or to Bob Arum, but Manny is going to take some time off that he rightfully deservers. It's that simple. Period." And just as recently as this past Sunday, Koncz would again reiterate those sentiments to Filipino TV5 sports station AKTV. "Honestly, there's been no discussions with Manny about boxing and we don't plan to discuss the opponent [in 2012] until after the holidays," said Koncz. Likewise, promoter Bob Arum has expressed little interest in negotiating a Mayweather fight, preferring instead to pursue a fourth fight with long-time rival Juan Manuel Marquez, who Pacquiao already holds two wins and draw with. In fact, just last week, when Golden Boy Promotions CEO Richard Schaefer asked retired federal judge Daniel Weinstein to reach out to Arum on behalf of Team Mayweather in hopes of beginning the negotiation process, he was informed that Top Rank was not even interested in discussing a Mayweather-Pacquiao fight. "The truth of the matter is that we received this afternoon an email from retired federal judge Daniel Weinstein, who has informed us that Top Rank is pursuing a rematch with Marquez and, therefore, is not interested in immediate talks for a possible Mayweather-Pacquiao fight," Schaefer would explain. Although Arum would immediately deny anyone from his company making such a statement, there's no way a retired federal judge would pass that information on to Schaefer if the conversation never took place and it wasn't true. In fact, given Judge Weinstein's relationship and dealings with both sides during previous disputes, it's highly likely that he got his information directly from Bob Arum himself. Regardless, there's no denying that both he and Koncz appear to be on the same page as it relates to a decision on Pacquiao's next opponent. "The last thing on my mind is figuring this out and who Manny Pacquiao is going to fight and what Manny's going to do next. That's the story. He's not going to do anything until probably April, May or June of next year anyway. So what is the big deal," Arum would also tell Satterfield of RingTV.com. Ironically, earlier this week, sources informed FightHype.com that Michael Koncz flew to Las Vegas to have an "emergency" meeting with Bob Arum to discuss the Mayweather fight. The news gave hope to many that perhaps they were indeed ready to begin negotiations with Team Mayweather. However, there are now rumblings that the true purpose of the meeting was to figure out a way to push their own agenda and convince Pacquiao to fight Marquez instead of trying to give him what he really wants, the mega-fight with Floyd Mayweather. While Koncz and Arum seem united in their position, these latest comments from Pacquiao regarding "ongoing negotiations" with Mayweather make it look like he's on a totally different page than that of his own promoter and advisor. Whether it's a lack of communication or simply someone dropping the ball, it seems like someboy has got some explaining to do.